When deciding on a new roof replacement, the most important things to consider are durability, cost, energy efficiency, sustainability as well as the cost of the materials that you select. All these elements inform one another. For instance, how well a roof holds up during harsh weather is eventually going to affect its longevity. Energy efficiency of the materials is going to affect the overall cost. In this post, we are going to discuss the top 3 roofing materials, ranked by cost and longevity. Use this read to consider the unique benefits of each roofing material and pick the right one for your house. Asphalt shingles are by far the most popular roofing material out there mostly due to their cost-effectiveness. However, you should be careful when it comes to durability. You should never go for the cheapest shingles even if the cost is a significant issue for you. Look for asphalt shingles that have a decent hail rating which is a great indicator of impact resistance as well as durability. Roofing material manufacturers are legally required to report the hail rating and so, if you do not see one, it is a red flag. Hail rating is especially important with asphalt shingles. Since they are so common, the quality tends to vary widely. The downside with asphalt is that it’s a petroleum-based material and that means it’s not the most sustainable roofing option out there. However, the shingles are recyclable. You can expect them to last for about 15 to 20 years. These shingles are basically made of fire-resistant raw materials like redwood or cedar. While they last longer than asphalt shingles, usually between 30 to 50 years, they are not as durable. And even though they are fire-resistant, they are not fireproof. Wood shingles are ideally prone to cracking and so, you should be on the look for a manufacturer with a decent hail rating. On the upside, wood is a natural insulator and so, you can expect double the energy efficiency that asphalt shingles provide. Also, since they are completely natural, these shingles are one of the most sustainable materials in the roofing industry. Metal roofing materials are usually made of steel, aluminum, zinc alloy or copper. They last for about 30 to 50 years but are slightly more expensive than their wood and asphalt counterparts. However, they are more durable. They are also impact resistant and will protect you from inclement weather. They also require a lot less maintenance compared to other materials. They are also very energy efficient. They reflect solar energy, acting as a natural insulator. This helps keep your house cooler during the warm season and warmer during winter. Also, if you love the sound of rain, metal is certainly the material to go with for roofing. Lastly, the recyclability of metal is unrivaled. Most metal roofs are not only created from recycled materials, but they are ideally 100 percent recyclable themselves. 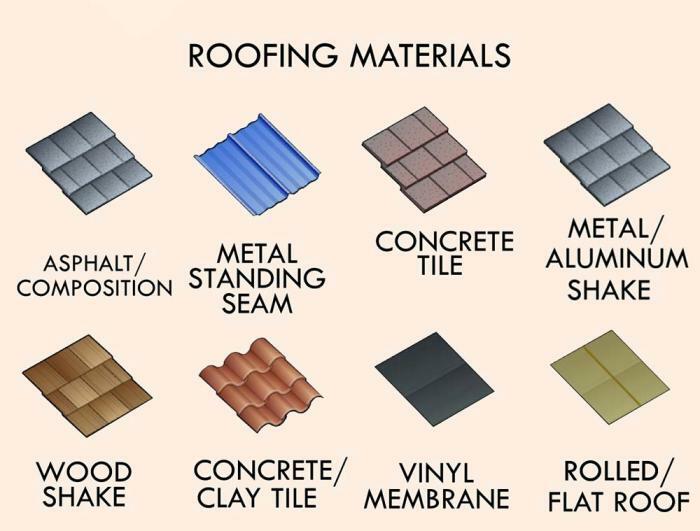 These, of course, are not the only roofing material options out there, but they are the most popular and most affordable.